Linux - Newbie This Linux forum is for members that are new to Linux. Just starting out and have a question? If it is not in the man pages or the how-to's this is the place! and after selecting windows 7 , I get "bootmgr is missing" message. Ubuntu loads normally. Boot sector info: No errors found in the Boot Parameter Block. # the 'exec tail' line above. # /etc/fstab: static file system information. # devices that works even if disks are added and removed. See fstab(5). Situation got worse. Tried to use bootrec /fixmbr from windows 7 DVD, now even ubuntu won't boot (grub boot loader seems to have been deleted). I am now booting from the ubuntu live cd. What can I do now?? Please help!! Notice sda3 is the equivalent of hd0,2. And so on. So sda5 would be hd0,4, and sdb2 would be hd1,1. Good luck. Last edited by spiderbatdad; 04-10-2011 at 06:59 PM. Last edited by bomberb17; 04-10-2011 at 07:12 PM. There's a lot of inconsistencies here. Implies we're not being told everything. At a rough guess I'd say you actually reformatted (rather than just resize) sda1 - which had all your windows boot files. Then deleted sda1. 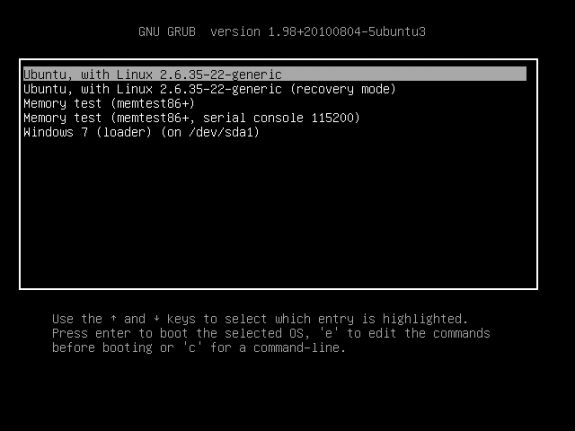 Then apparently (re-)run update-grub. Let's see another bootinfoscript output as it is now. All times are GMT -5. The time now is 01:28 AM.